2008 Alexana Signature Pinot Noir. Barrel Selection – 6 best barrels (140 cases). Primarily Pommard clone. Floral nose of rose and violet, red and black cherry, coffee, earth, and a hint of mocha or milk chocolate. Exceptional balance, long finish. Very feminine! Very Dundee! 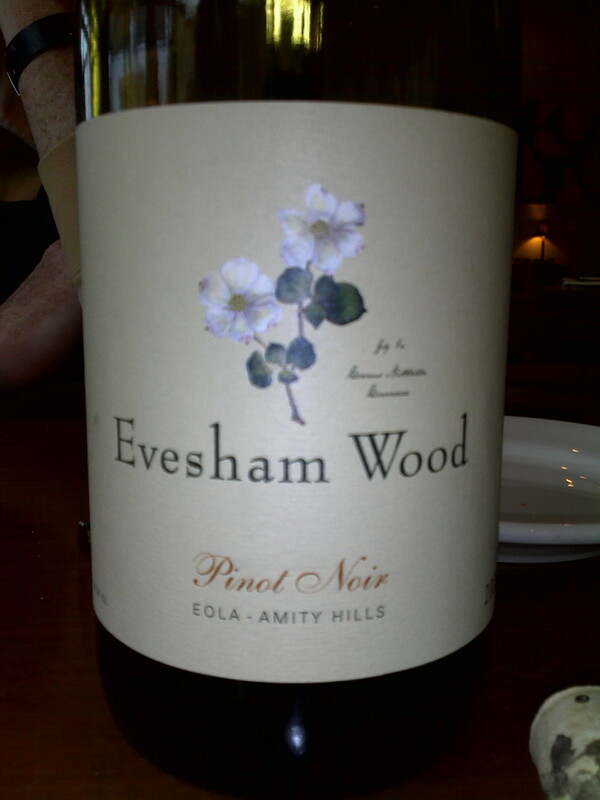 The 09 Evesham Wood – Eola-Amity Hills Pinot Noir. Popped and poured to accompany Cascade Natural Oregon burgers and truffle fries. Beautiful nose of red fruit, baking spice, earth, and wild mushrooms. Feminine in style, with red cherry, wild strawberry, cinnamon, tobacco, and almost a minty greenness. Bright acidity, fine tannic structure, and beautiful balance. Popped and poured to accompany spice-rubbed pouisson. Huge nose of black fruit, french vanilla, milk chocolate, and cinnamon. Follows through on the palate with black cherry, blackberry, cinnamon, and cassis. The wine is huge and mouthfilling and balanced, with plenty of tannic oak grip and a decent dose of acid that leaves your mouth watering. I would typically say that this was not my style of Pinot Noir, as I prefer what I characterize as a “feminine” style of pinot, light, delicate, with layers of nuance and finesse. This wine is more of a Pinot Noir for Cab lovers. However, with the complex flavors of the spice-rubbed pouisson, this wine was a great match. This wine is a bit of a departure for me when it comes to Haut Brion in that it is much younger than any of the wines that I have tried from this chateau. Most of the wines I have tried have been at least 10 to 15 years older or older, so having a Haut Brion with fruit was a bit of a novelty. This wine had a lovely nose of violets, red fruit, and earth. The palate shows black currant, black cherry, tobacco, and leather. The tannins are relatively finely structured, and the wine has a decent dose of acid, and is seamlessly balanced. This wine comes across on the nose and palate more like a white Rhone than a Chardonanay (not that that is necessarily a bad thing). Aromas of honeysuckle, peach, and baked apple, flavors of Bosc pear, peach, mixed citrus (tangerine, lime) and a hint of wet stone minerality. Really nice mouthfeel and balance, with plenty of acidity to allow it to pair well with rich foods. Only sees about 20% new oak during elevage, so not overly woody, either. Beautiful nose of honeycrisp apple, tropical fruit, and wet stone. Aromas follow through on the palate… crisp acidity, wonderful balance, and the wine seems to gain depth and a hint of sweetness with additional air and a bit of warming from cellar temperature. 2008 Brick House Chardonnay (full 750) – the same aroma and flavor profile as the 2007, but seemingly more full bodied, rounder, and more plush, while still retaining the crisp acidity. When I had these a year ago side-by-side at the winery, the 2007 was my clear favorite (I thought the 2008 was flabby by comparison to the sleek racy acidity of the 2007, but the 2008 had only recently been bottled). Now with another year of age and some time to settle down, the 2008 may turn out to be my current favorite.